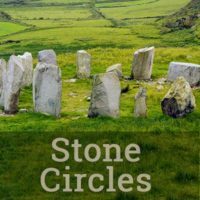 “They heaved the stone; they heaped the cairn. Between the cliff and wave. In loneliness and awe secure. Who in her life was pure. 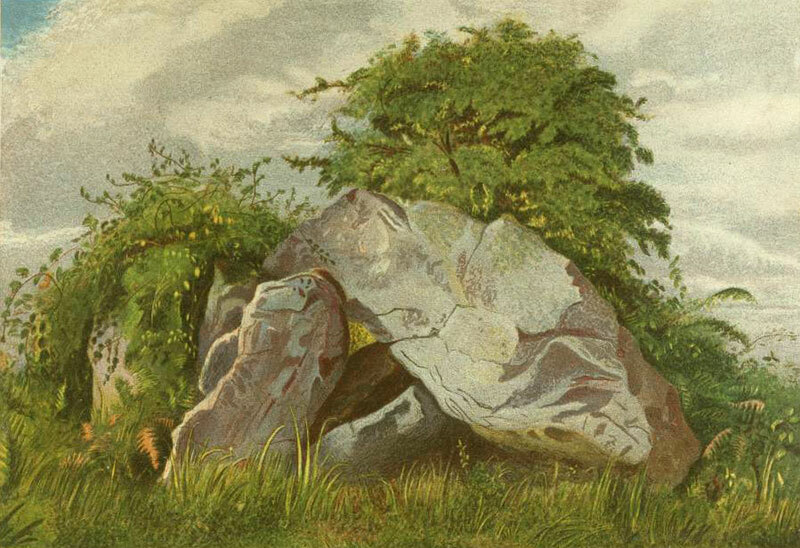 The Cromlech on Howth : a poem by Samuel Ferguson; with illuminations from the Books of Kells & of Durrow, and drawings from nature by Margaret Stokes (1861). Drag within the image to explore the Howth Dolmen in a partial panorama. The 176 m (578 ft) Hill of Howth, overlooking Dublin Bay from the north, seems a likely spot for the nurturing of place-based legends. 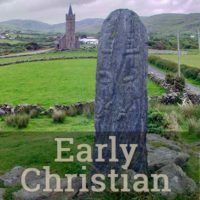 It was known as the Ben Edair of Fionn MacCumhaill’s army, the Fianna. 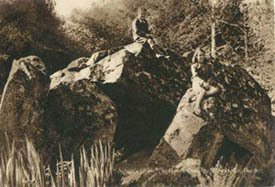 Muck Rock, the prominence immediately above the Howth Dolmen, is likely the source of its immense quartzite capstone, 5 m (16.5 ft) long, 5.5 m (15 ft) wide, and up to 2.5 m (8 ft) thick. 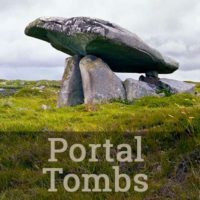 Local lore knew this portal tomb as “Fionn MacCumhaill’s Quoit” [a dolmen, or cromlech, today called a portal tomb].2 But nineteenth-century poet and antiquarian Sir Samuel Ferguson believed it to be the grave of the legendary Aideen, who died of grief when her husband Oscar, grandson of Fionn, was slain in battle. 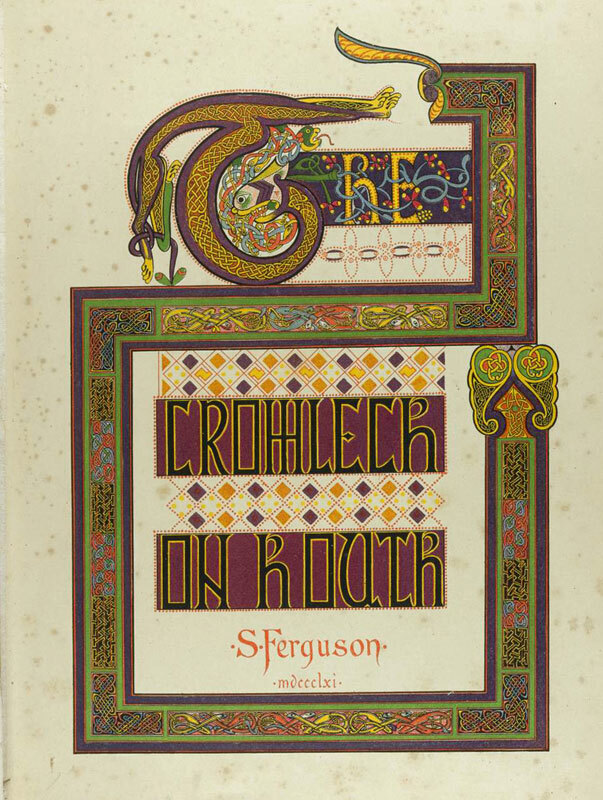 Ferguson commemorated the site in his lavishly illuminated poetic work, The Cromlech on Howth, excerpted above. Title page, The Cromlech on Howth. Ferguson and other visitors of his day would have found the monument in the “dark and beautiful woods” of Howth Castle’s classical seventeenth century landscape (see illustration below, left).4 But today’s tourists will encounter it just beyond the entrance to the “Rhododendron Walk” near the putting green of the Deer Park Hotel’s golf course. 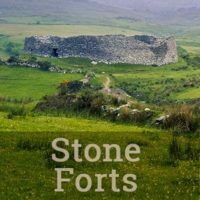 Fionn MacCumhaill began the legendary lineage of Iron Age warriors, and his son Ossian was the poet and chronicler of these Fianna. 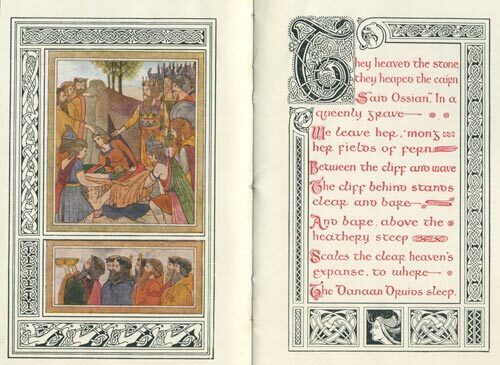 Ossian had a son, Oscar, who inherited the entire splendid battle prowess exhibited by his father and grandfather. He was known as the bravest of all the Fianna; he killed three kings in his first foray into battle. Ferguson’s text reveals that after the news of the battle reached Aideen, staying at her father’s mansion at Howth, she was stricken with grief and died. 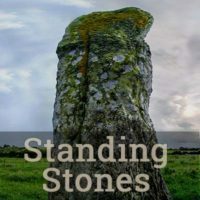 Ossian and those of her husband’s comrades who survived the slaughter were so moved by the dual tragedies that they built the cromlech at Howth, which we see in a collapsed state today. 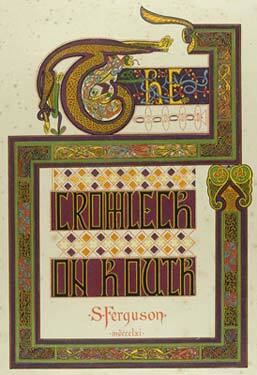 Ferguson’s poetic tribute to Oscar and Aideen was well received,7 perhaps in no small measure because it was initially published in a 1861 large format limited-edition monograph, with its lithographed vellum-like pages illuminated with the motifs from two of Ireland’s most revered medieval treasures: the Book of Kells and the Book of Durrow. The Cromlech on Howth, by Margaret Stokes, 1861. This came about because of his friendship with the illustrator Margaret Stokes, whose family, like his own, had a home on Howth. 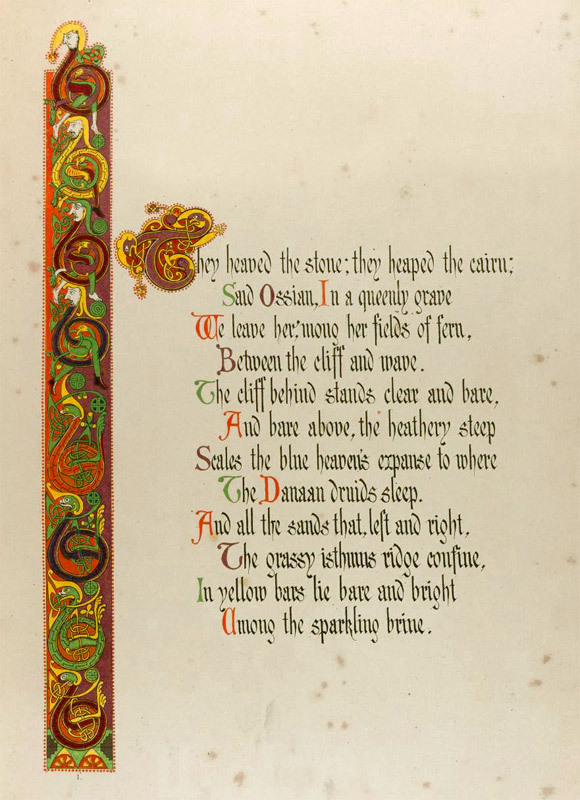 Ferguson wrote the poem “Aideen’s Grave” in 1858, but was unsuccessful in his attempts to publish it until he recruited his neighbor, Miss Stokes, to create the illuminated text and the “drawings from nature.” But as this was Stokes’ first published work, she was acknowledged on the first title page only by her initials.8 Ferguson also recruited his colleague at the Royal Irish Academy, the prominent antiquarian George Petrie, to edit the book’s concluding essay on Celtic ornamental art. 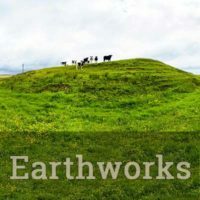 Folk tradition can have many sources and can serve as an inspiration for literature. However the process also works well with the dynamics reversed: literature can and does inspire folklore. 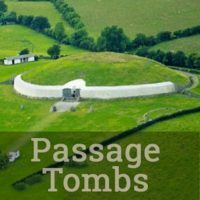 It seems that Ferguson’s book created a site-based folklore with staying power, as most references to the portal tomb today mention the connection to Aideen. 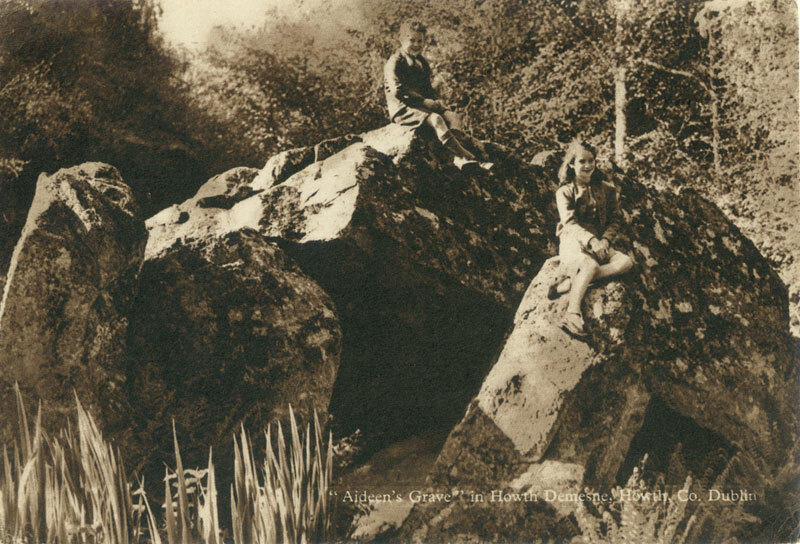 (See the postcard reproduced to the right.) Author Thomas Hofheinz believes that Ferguson’s poem, whatever its folkloric origin, influenced the later Irish writers, such as Yeats and Joyce, who also looked to geographically-based mythology for their inspiration. 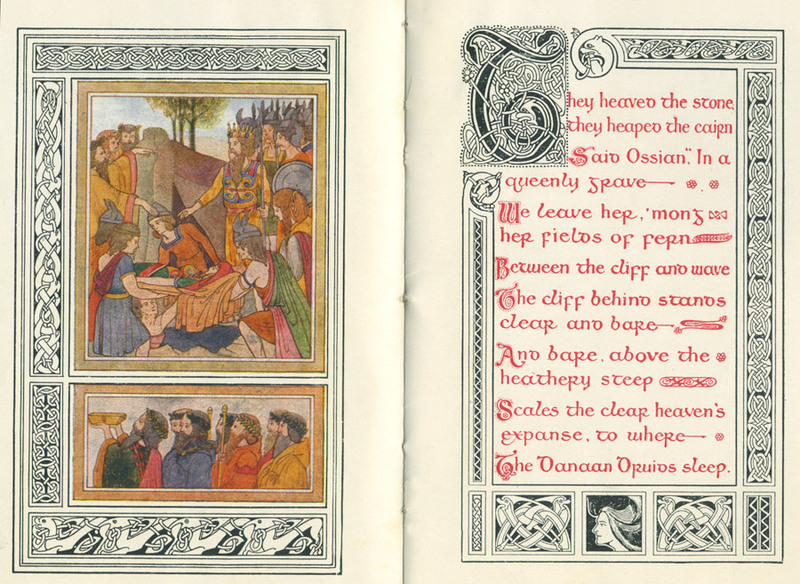 Illustrations by George Cogan, and Joseph Tierney. 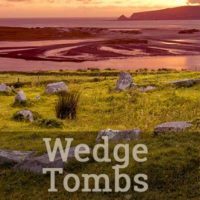 Aideen's Grave. Dublin: Talbot, 1925.